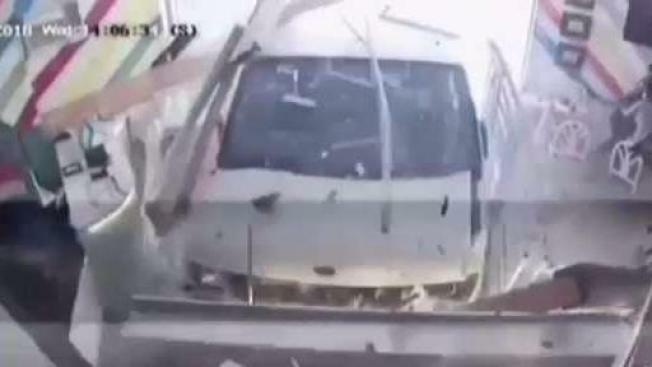 A van filled with children slammed into a North Miami restaurant. NBC 6 Reporter Jamie Guirola explains. A van carrying children from a Florida Catholic school plowed into a pizzeria in North Miami Wednesday afternoon. The crash happened at G's BBQ & Pizza at Northwest Seventh Avenue and 122nd Street. Police said the van was cut off by another car and the driver swerved in an attempt to avoid a collision, but crashed into the building. Officials said the 10 students from St. James Catholic School inside the van were were not injured. Their ages were not immediately known. The van's driver and patrons and employees inside the restaurant also escaped without injuries. The owner said he opened the restaurant just two weeks ago and hopes to reopen soon.